Transportation Analysts work and help the business units in logistics, shipment, and procurement related activities. Transportation analysts’ responsibility is to collect and analyze transportation data and determine cost-effective ways to transport the goods in a timely and efficient manner. 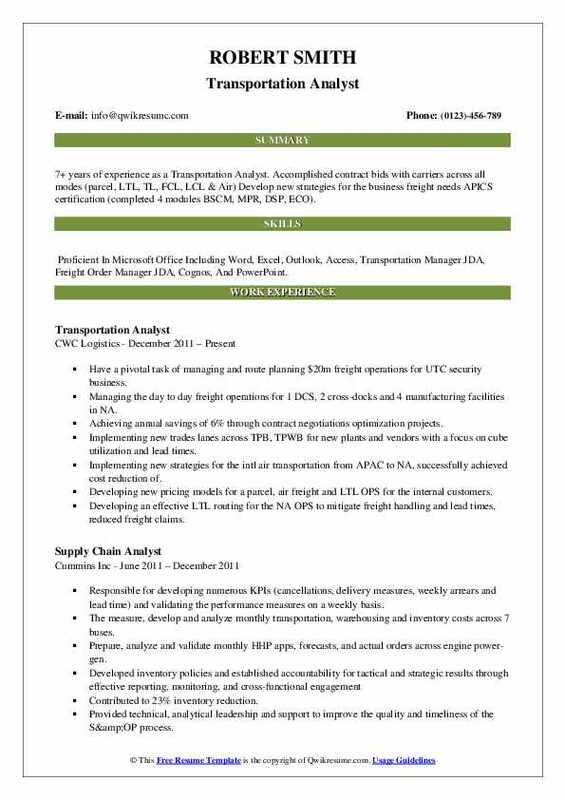 The common responsibilities that are portrayed in the Transportation Analyst Resume include analyzing freight bills, shipment planning, generating periodic customer metrics, researching and creating cost estimates, negotiating transport options or contracts, identifying inefficiencies, budget variances and drafting recommendations to eliminate such unwanted expenditures. Transportation analysts should possess computing skills and have an in-depth knowledge of the company’s transportation software and programs. They should further show competency in statistical and transportation analysis tools. A Bachelor’s degree in business, logistics, industrial engineering or other related fields is commonly regarded as the minimum qualification for this job role. 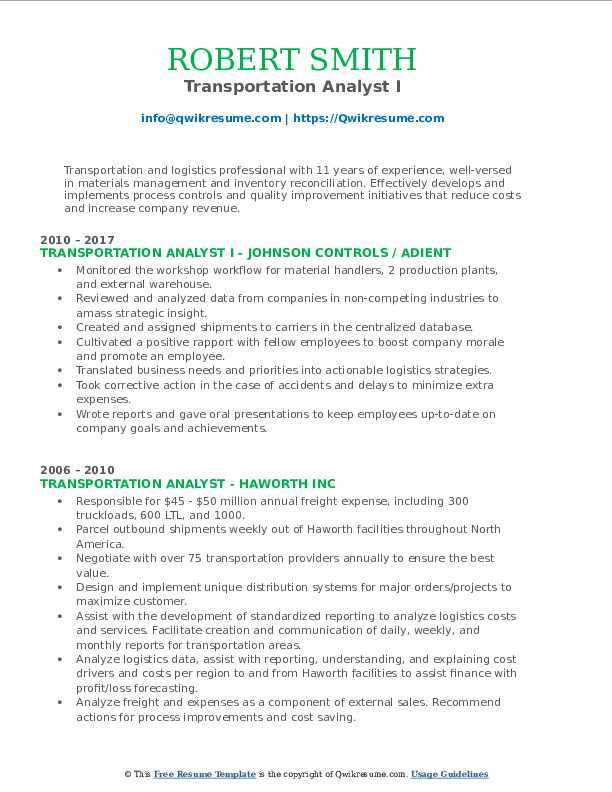 Summary : 9 years of experience as a Transportation Analyst is seeking to ascend to the next level in my career and continue to build on my successes obtained through strong analytical, organizational, and process design/automation skills. Skills : Microsoft Word, Excel, PowerPoint, Outlook, Access, SAS, SAP, CEIL, B-2 Log, Manitou 2, Oracle, And Adobe, Strong Customer Service, And Great Attention To Detail. Set up/scheduled FTL/LTL and spot trailers to 9 distribution centers and 102 branch locations. Assisted over 102 branch locations with all transportation/logistics issues to include any inventory irregularities. Handled all inbound and outbound shipments to branches, hubs, customers, and vendors. Handled all freight forwarding issues with NVOCCS, direct steamship line providers and intermodal carriers. Issued quotes from vendors, customers, and branches including transit time. Filed claims with carriers for LTL/FTL, small parcel and ocean carriers for damage or missing freight. Freight bill payments to include all FTL/LTL and small parcel shipments for all of Honeywell ADI. Worked with all finance departments to confirm, deny or pay other invoices. Summary : 12+ years of versatile experience in Traffic Engineering and Transportation Planning Worked on a variety of projects involving Traffic Engineering Studies, Signal Timing and Coordination, Traffic Impact Studies and Corridor Studies. Skills : Traffic Engineering Studies Traffic Impact Studies Signal Timing And Coordination Travel Forecasting Corridor Studies GIS And Database Application Development COMPUTER Software SYNCHRO, HCS, SimTraffic, Cube, ArcGIS Languages C#, Visual Basic (VB) And Visual Basic For Application (VBA) Packages Microsoft Office Suite, SAS Databases MS Access, MS SQL Server, MySQL And Oracle. Responsibilities included traffic engineering studies, transportation planning studies, traffic safety studies, corridor and area-wide planning studies, signal timings, traffic impact studies, impact fee studies. Developing signal timing and coordination plans and responsible for implementing the timing plans along the corridor. Review of developments of regional impact (Idris) comprehensive plans. Designing and developing the database and GIS applications. Concurrency management systems (CMS) and district-wide roadway database. Was involved in writing proposals, scheduling, execution of projects and client maintenance. Mentored team. Members with transportation planning and traffic engineering principles and usage of software. Programs including synchro, sim traffic, ArcGIS, HCS, cube a Microsoft office suite network comprising about 104 signalized intersections in synchro. Projecting future year traffic volume and re-distributing traffic to determine the future year turning movement volumes to account for the committed roadway improvements. Developing coordinated signal plans along with an implementation of transit priority treatments. Developed gis shapefiles and maps. 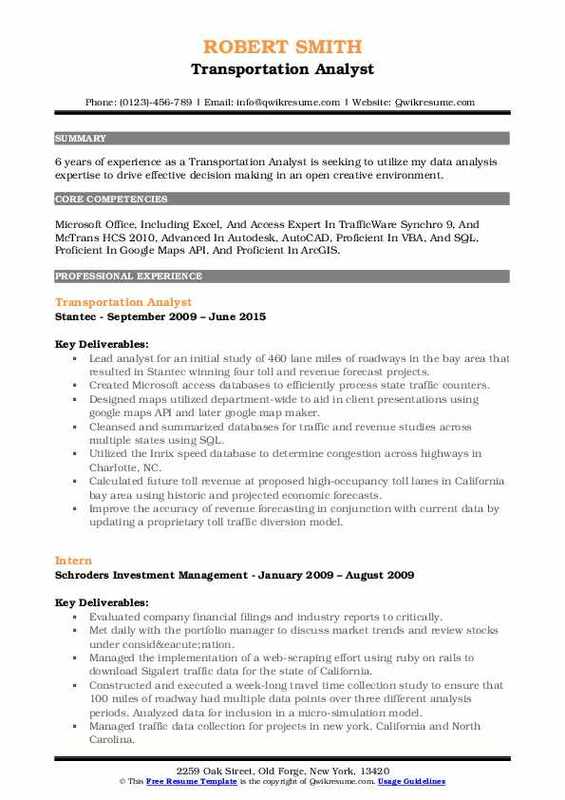 Summary : 7+ years of experience as a Transportation Analyst. Accomplished contract bids with carriers across all modes (parcel, LTL, TL, FCL, LCL & Air) Develop new strategies for the business freight needs APICS certification (completed 4 modules BSCM, MPR, DSP, ECO). Skills : Proficient In Microsoft Office Including Word, Excel, Outlook, Access, Transportation Manager JDA, Freight Order Manager JDA, Cognos, And PowerPoint. Have a pivotal task of managing and route planning $20m freight operations for UTC security business. Managing the day to day freight operations for 1 DCS, 2 cross-docks and 4 manufacturing facilities in NA. Achieving annual savings of 6% through contract negotiations optimization projects. Implementing new trades lanes across TPB, TPWB for new plants and vendors with a focus on cube utilization and lead times. Implementing new strategies for the intl air transportation from APAC to NA, successfully achieved cost reduction of. Developing new pricing models for a parcel, air freight and LTL OPS for the internal customers. Developing an effective LTL routing for the NA OPS to mitigate freight handling and lead times, reduced freight claims. Helping streamline the accessorial charges across all modes, reworked contracts in compliance with the business. 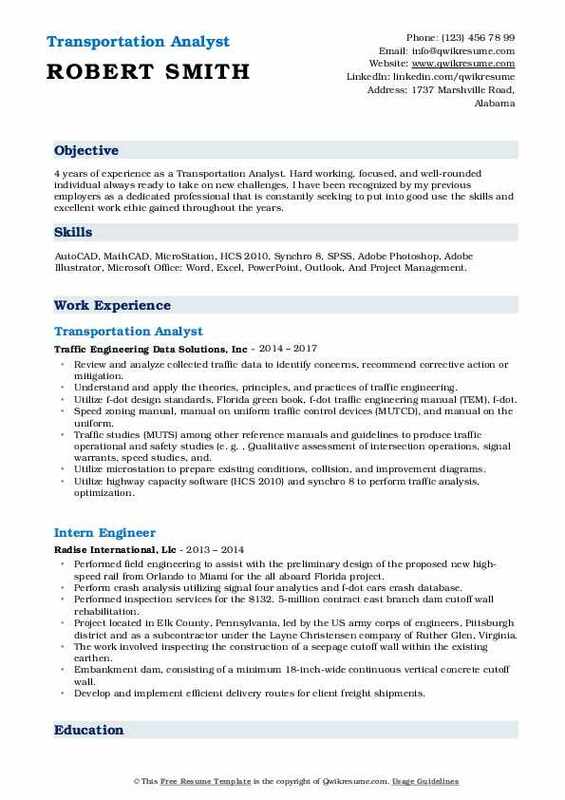 Headline : 5 years of experience as a Transportation Analyst is looking to use my finance, organizational, and problem-solving skills. I enjoy working on lean projects for continuous improvement and I am looking to mature in my career and progress in responsibility. Skills : Listening, Speaking And Writing, Teamwork, Analytical And Problem-solving, Personal Management, And Interpersonal Effectiveness. Prioritized account requirements and maintained continuous improvement on accounts EDI and web. Developed and prepared EDI documentation for internal and external use. Acted effectively as point-of-contact on the status of EDI transactions from internal and external customers. Educated and trained carriers on EDI application and carriers website. Provided efficient technical support during and after implementation for EDI/FTP configurations and setup. Conducted and performed analysis of EDI transactions, document and produced metric reports. Proficiently participated in resolving EDI issues related to customer and supplier EDI requirements. Manned for the efficient processing of incoming and outgoing EDI messages. Identified and recognized opportunities and resolved problems related to EDI. Conducted data analysis and perform impact analysis of truckload and LTL networks. Headline : 6+ years of experience as a Transportation Analyst. Results-driven, dependable, detail-oriented individual with demonstrated strengths as a team player, organizer, and researcher. Experience across multiple operational and financial functions. Ready and willing to assist others inside and outside the department. Excellent communication and presentation skills. 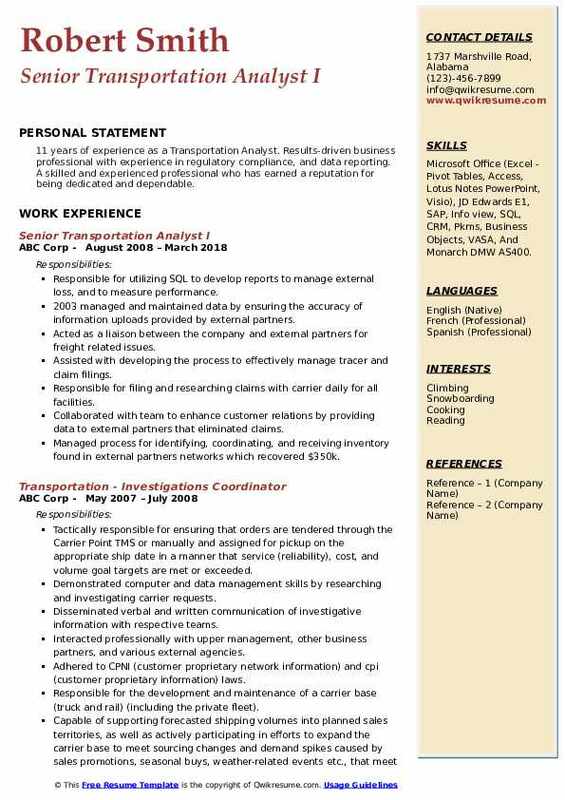 Skills : Windows, Microsoft Office: Word, PowerPoint, Excel, Access, SAP Transportation Subject Matter Expert, Logistics And Distribution Management. Creating and maintaining multiple internal operational and financial spreadsheets (ms excel) and databases (ms access) for use in reporting and analysis. This provides a comprehensive environment for the running of queries and reporting for the creation of metrics and the analysis of transportation costs. Classifying and maintaining accounts for small package carriers, comprising vendor-to-store and vendor-to-distribution-center accounts, to ensure that accounts are paid and proper transactions occur under the appropriate accounts. Checking new accounts, current accounts, and old accounts that become active. Categorizing and maintain store-to-store accounts and other affiliated company accounts. Supporting senior financial d2c analyst in maintaining and classifying direct-to-customer (d2c) accounts and vendor-to-customer (v2c) accounts. Analyzing the by mode databases with information initially supplied by a third-party vendor. Confirm if payments are correct and assign mode movement (air, rail, truck, etc. ) categories to line items as needed. Building the weekly financial recap report that shows key spend vs. Paid data. Identify trends or issues and work with management in other departments to solve the problems. Updating the national fuel report to reflect national diesel prices and current oil prices. Distribute the report to other team members (30 people) for multiple purposes. 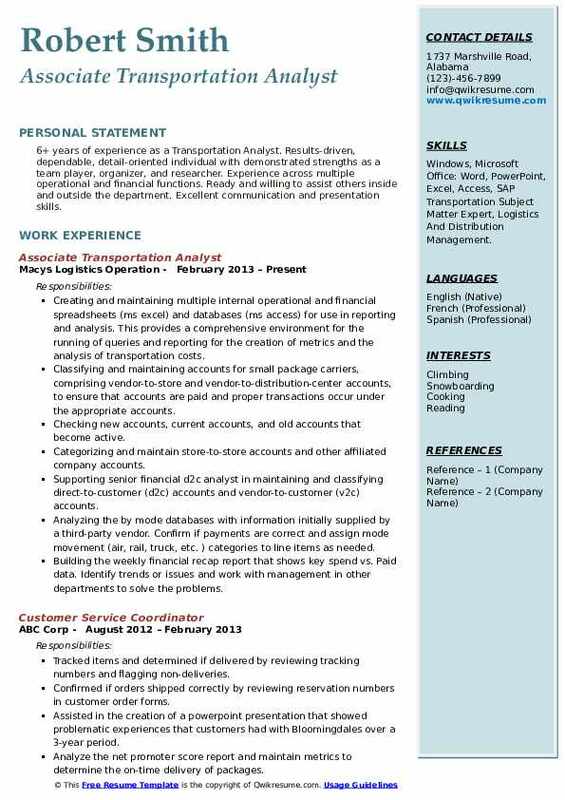 Objective : 4 years of experience as a Transportation Analyst. Hard working, focused, and well-rounded individual always ready to take on new challenges. I have been recognized by my previous employers as a dedicated professional that is constantly seeking to put into good use the skills and excellent work ethic gained throughout the years. Skills : AutoCAD, MathCAD, MicroStation, HCS 2010, Synchro 8, SPSS, Adobe Photoshop, Adobe Illustrator, Microsoft Office: Word, Excel, PowerPoint, Outlook, And Project Management. Review and analyze collected traffic data to identify concerns, recommend corrective action or mitigation. Understand and apply the theories, principles, and practices of traffic engineering. Utilize f-dot design standards, Florida green book, f-dot traffic engineering manual (TEM), f-dot. Speed zoning manual, manual on uniform traffic control devices (MUTCD), and manual on the uniform. Traffic studies (MUTS) among other reference manuals and guidelines to produce traffic operational and safety studies (e. g. , Qualitative assessment of intersection operations, signal warrants, speed studies, and. Utilize microstation to prepare existing conditions, collision, and improvement diagrams. Utilize highway capacity software (HCS 2010) and synchro 8 to perform traffic analysis, optimization. 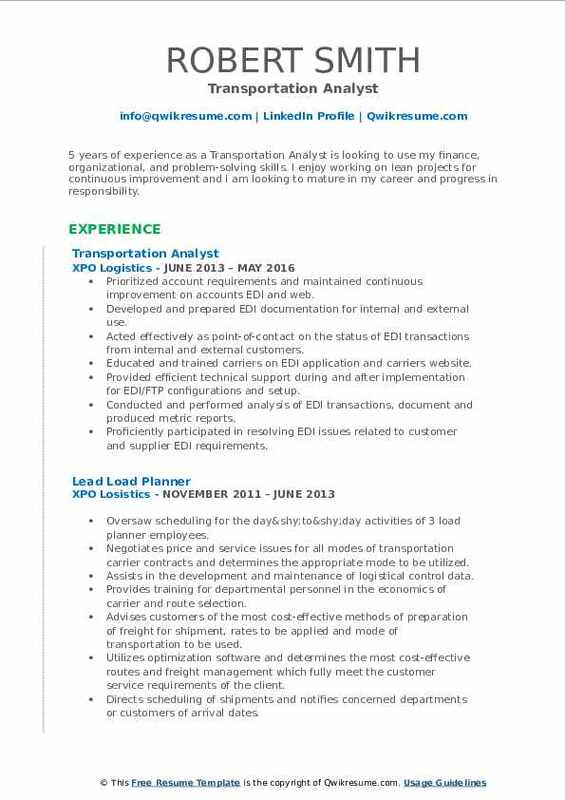 Summary : Transportation and logistics professional with 11 years of experience, well-versed in materials management and inventory reconciliation. Effectively develops and implements process controls and quality improvement initiatives that reduce costs and increase company revenue. Skills : MS Office, DOT Regulations, Familiar With RF Systems, HAZMAT, TMS, OSHA, WMS, Supply Chain And Resource Management, Excellent Time Management, Computer-savvy, And Budget Management. Monitored the workshop workflow for material handlers, 2 production plants, and external warehouse. Reviewed and analyzed data from companies in non-competing industries to amass strategic insight. Created and assigned shipments to carriers in the centralized database. Cultivated a positive rapport with fellow employees to boost company morale and promote an employee. Presented carrier-performance metrics and monthly costs report to the executive team. Recommended investments in technology, capital, equipment systems and other assets to improve service. Headline : 6 years of experience as a Transportation Analyst is seeking to utilize my data analysis expertise to drive effective decision making in an open creative environment. 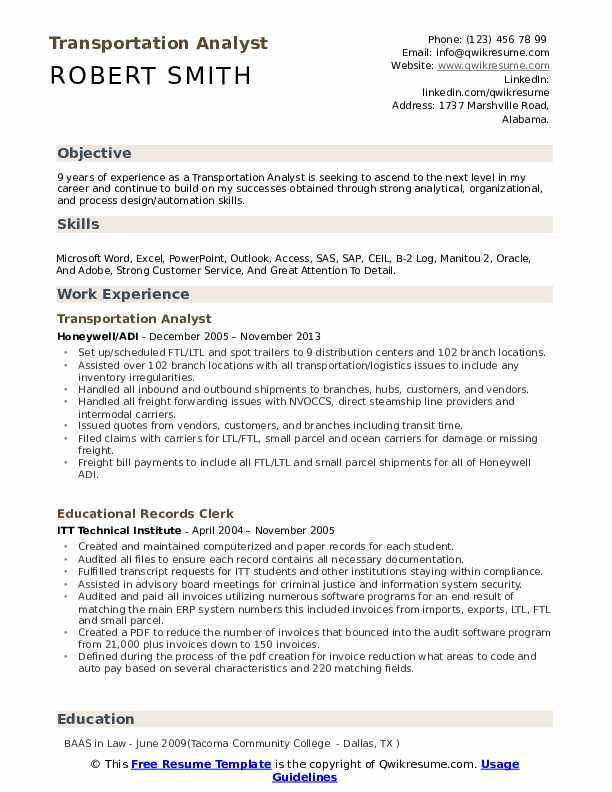 Skills : Microsoft Office, Including Excel, And Access Expert In TrafficWare Synchro 9, And McTrans HCS 2010, Advanced In Autodesk, AutoCAD, Proficient In VBA, And SQL, Proficient In Google Maps API, And Proficient In ArcGIS. Lead analyst for an initial study of 460 lane miles of roadways in the bay area that resulted in Stantec winning four toll and revenue forecast projects. Created Microsoft access databases to efficiently process state traffic counters. Designed maps utilized department-wide to aid in client presentations using google maps API and later google map maker. Cleansed and summarized databases for traffic and revenue studies across multiple states using SQL. Utilized the Inrix speed database to determine congestion across highways in Charlotte, NC. Calculated future toll revenue at proposed high-occupancy toll lanes in California bay area using historic and projected economic forecasts. Improve the accuracy of revenue forecasting in conjunction with current data by updating a proprietary toll traffic diversion model. 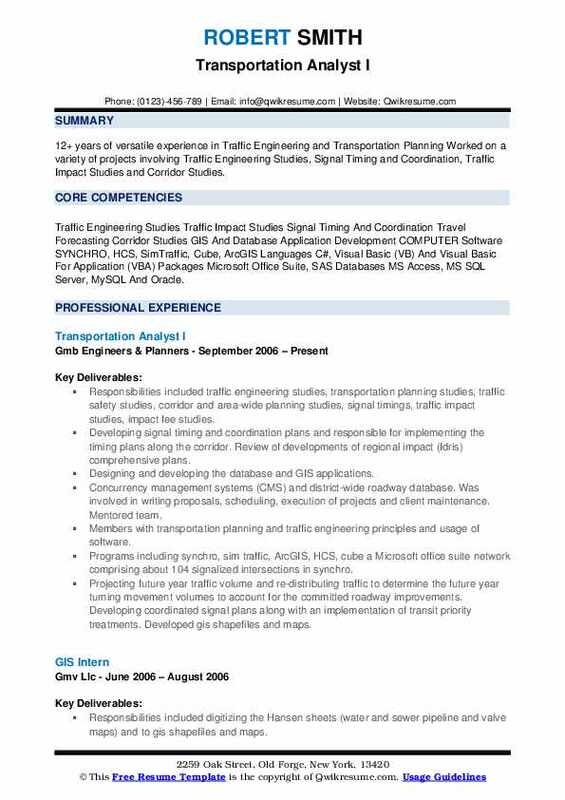 Summary : 11 years of experience as a Transportation Analyst. Results-driven business professional with experience in regulatory compliance, and data reporting. A skilled and experienced professional who has earned a reputation for being dedicated and dependable. Skills : Microsoft Office (Excel - Pivot Tables, Access, Lotus Notes PowerPoint, Visio), JD Edwards E1, SAP, Info view, SQL, CRM, Pkms, Business Objects, VASA, And Monarch DMW AS400. Responsible for utilizing SQL to develop reports to manage external loss, and to measure performance. 2003 managed and maintained data by ensuring the accuracy of information uploads provided by external partners. Acted as a liaison between the company and external partners for freight related issues. Assisted with developing the process to effectively manage tracer and claim filings. Responsible for filing and researching claims with carrier daily for all facilities. Collaborated with team to enhance customer relations by providing data to external partners that eliminated claims. Managed process for identifying, coordinating, and receiving inventory found in external partners networks which recovered $350k. Maintained and analyzed monthly report to accurately account losses and recoveries. Formulated a process to provide data to internal partners to further investigate the use of equipment. 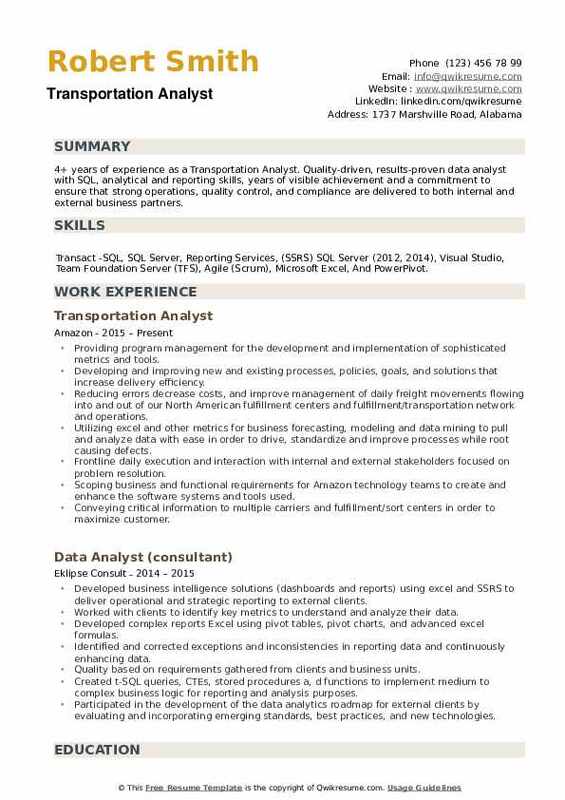 Objective : 4+ years of experience as a Transportation Analyst. Quality-driven, results-proven data analyst with SQL, analytical and reporting skills, years of visible achievement and a commitment to ensure that strong operations, quality control, and compliance are delivered to both internal and external business partners. Skills : Transact -SQL, SQL Server, Reporting Services, (SSRS) SQL Server (2012, 2014), Visual Studio, Team Foundation Server (TFS), Agile (Scrum), Microsoft Excel, And PowerPivot. Providing program management for the development and implementation of sophisticated metrics and tools. Developing and improving new and existing processes, policies, goals, and solutions that increase delivery efficiency. Reducing errors decrease costs, and improve management of daily freight movements flowing into and out of our North American fulfillment centers and fulfillment/transportation network and operations. Utilizing excel and other metrics for business forecasting, modeling and data mining to pull and analyze data with ease in order to drive, standardize and improve processes while root causing defects. Frontline daily execution and interaction with internal and external stakeholders focused on problem resolution. Scoping business and functional requirements for Amazon technology teams to create and enhance the software systems and tools used. Conveying critical information to multiple carriers and fulfillment/sort centers in order to maximize customer. Managing inbound transportation issues with external/internal customers. Updating standard operating processes to improve work quality and frontline effectiveness. Connecting weekly with operations on site to ensure level scheduling and accurate labor planning.